Drives distant analog meter, digital meter, computer interface, data logger, etc. Built-in zero offset. 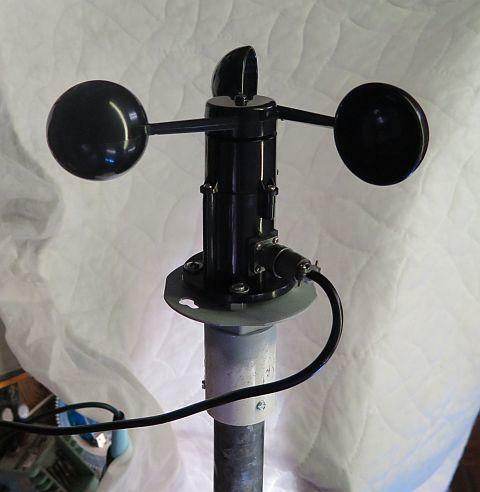 The 1733 Anemometer from Adafruit is a reasonably-priced, well-built wind-speed sensor. 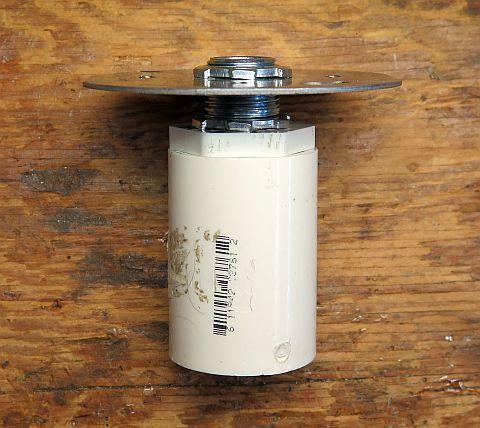 It features a built-in transducer that converts wind speed to an analog voltage output - no external pulse counter needed. This article describes my 1733 installation and the circuit that converts the voltage from the anemometer to loop current, enabling transmission over a pair of wires to a distant (or local) analog or digital meter, computer interface or logging device. 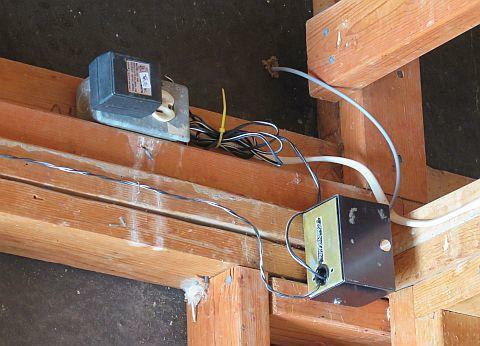 The advantage of using current to transmit an analog quantity is that the length of the wire pair to the metering device is virtually unlimited. 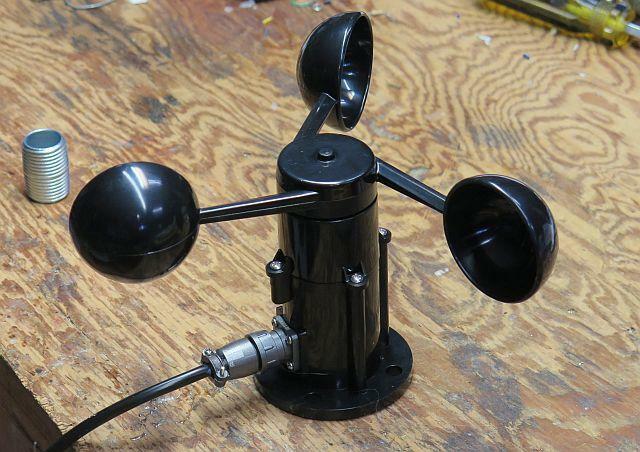 An alternate approach would have been to do an analog-to-digital conversion at the site of the anemometer and transmit the data digitally (and wirelessly) to a microcontroller or computer. But I really wanted an analog meter, and the distance involved wasn't that great (150'), so opted for the current loop. 1" to 1" PVC (sched. 40) coupler. 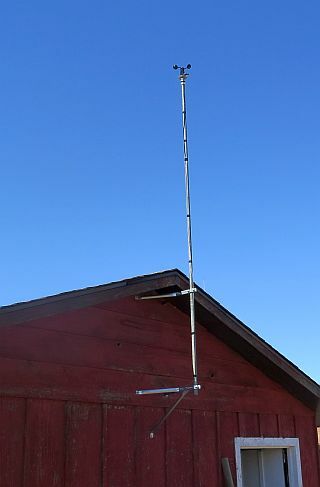 1¼"x10' (3m) TV antenna mast. The key take-away from the specs for the 1733 is that, from a baseline voltage of 0.4 volts with no wind, its output voltage increases by 49.4 mV for every 1 m/s increase in wind speed, or 22.1 mV for every 1 MPH increase, and continues to increase (by extrapolation) up to 3.46 V (70 m/s, 156 MPH). The circuit in Figure 1 converts the output voltage from the anemometer to a corresponding current in the remote meter loop. Changing the value of the current sensing resistor (R1) changes the voltage-to-current ratio, making the circuit adaptable to virtually any DC meter. (The value of R1 is calculated using one of the equations below.) The circuit can output currents up to 20 mA. U1a is the meter loop driver. The opamp monitors the voltage drop across R1 and supplies current to the loop sufficient to exactly offset the voltage from the anemometer. 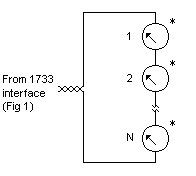 The magnitude of the current flowing in the loop is thus independent of loop resistance. U1b and the associated circuitry provide a regulated current sink for R1 and the meter loop. The circuit maintains the voltage at node 1 at exactly 0.4 volts. Thus, when the wind is dead calm and the anemometer's output is 0.4 volts, the current through the loop will be zero. Resistor R1 (*) sets wind speed-to-current ratio. 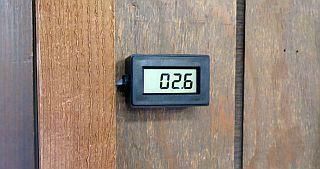 The resistor can be selected to provide a full-scale reading on any meter at any wind-speed. See Calculating R1. The value shown (1.10k) provides 1 mA at 50 MPH (full-scale on the 1 mA meter). **The voltage-to-current converter should be located as near as possible to the anemometer: the cable from the anemometer to the converter should be as short as possible. The wire pair from the converter to the meter can be any length up to 8000 ohms round-trip at 1 mA. This works out to something like 50 miles (80km) using AWG 22 (.65 mm) wire. The converter is in the box at lower right. 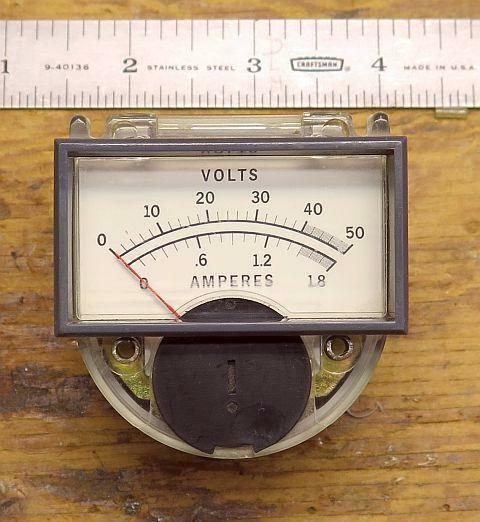 Chosen for its convenient scale (0-50), the meter was once part of a HP bench power supply. Ifs is full-scale meter current in amps. The circuit in Figure 2 can be used if a digital readout is preferred. The 49.9-ohm shunt resistor across the input terminals of the meter "converts" the current to a voltage. The meter will read full-scale (199.9 mV) at 200 MPH (4 mA). Shunt resistor (**) value shown produces full scale reading at 4 mA. Next to the back door, at eye level. Ifs is full scale wind speed current in amps. *Meters or other device/s (data logger, chart recorder, etc. 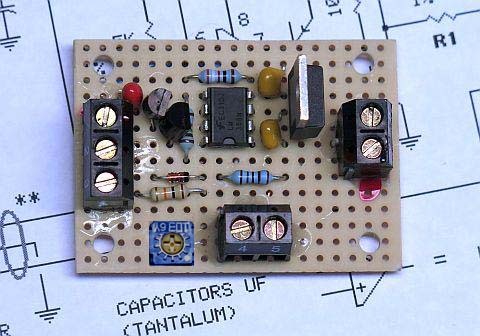 ), including shunt resistors. Mix or match. Read about how to do that here.